Ford Motor Company has continued to show off the new Shelby GT350 Mustang with another new action-packed video discussing the aspects of the super-Stang that will make it so special – this time showing the new Shelby in action at Virginia International Raceway. Over the past few weeks, Ford Motor Company has offered up a handful of short videos highlighting different aspects of the new Ford Shelby GT350. This time, the team has taken the new road gripping Mustang to Virginia International Raceway, where the narrator discusses the aspects that will make this new Shelby the best handling Mustang of all time. This new action video of the Ford Shelby GT350 Mustang at Virginia International Raceway shows a variety of clips of the car roaring around the track – both in mule form and in what appears to be production form. 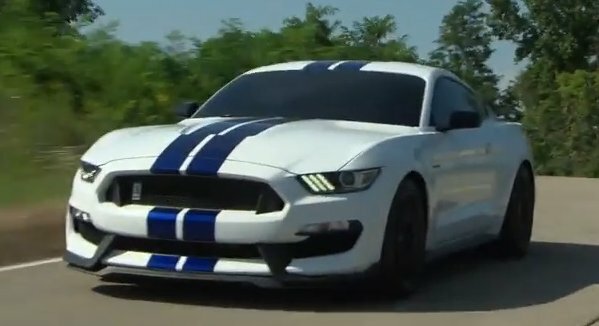 The test car shots were likely captured prior to the new GT350 being introduced (otherwise, why would it still be all covered up) while the shots of the white car above looks very much like the car that has been on display at a variety of auto shows around the country. However, regardless of whether the new Shelby GT350 Mustang was in mule form or production form, it has a host of features under the car that will make it the best handling Ford pony car of all time. This includes a similar four wheel independent suspension setup to what is found on the 2015 Mustangs in dealerships around the country, but new for the GT350 is a MagneRide active damper system that allows for a more aggressive suspension setup without losing basic drivability. Fords Vehicle Dynamics Development Engineer Dave Harmison walks us through these key handling features and he touches on the advantages of the system – promising that this setup will allow the car to do “some pretty astounding things”. Really, we don’t learn anything new about the next generation Shelby Mustang, but this video gives us another chance to see and hear the GT350 as it is being pushed to its limits. Also, while the focus is on the suspension setup and the handling capabilities, the 5.2L flat plane V8 of the new Shelby GT350 Mustang is well represented in the soundtrack of the video, with some great high RPM blasts along the straights of VIR.